When I first started house-hunting, the thing that appealed most to me about my neighbourhood was my developers clever use of space. I live in a suburb – land of cookie-cutter houses and three-car garages. For the most part, developers have been far from modest with their use of land which has resulted in rambling neighbourhoods that aren’t pedestrian friendly and forces residents to rely on their cars far too much. I’m proud to say that my neighbourhood is different. The density of my community is closer to that of Old Ottawa South which makes it more walkable and dense. My neighbours and I are, for the most part, first-time homeowners: single people, newlyweds or families just starting out – we are a neighbourhood of starter homes. Instead of backyards, most of the houses have decks in either the front or back. Which works just fine since most of us don’t have a real need for a private yard yet. Plus there is a great community park, complete with play structure, so that all the neighbourhood kids still have a big green patch of grass to run around in. That being said, I don’t have much green space to work with at my place, and I have absolutely zero when it comes to my deck. One of my primary goals in designing the deck will be to “green” the space with plants, with a focus on low maintenance and container friendly ones – likes hostas and succulents, which will also provide some much needed colour when they bloom. I’ll also be creating an eating area where I can enjoy dinners all summer long, and maybe even add a barbeque. The front porch is in for some work too, mainly to add some more greenery and to create a comfy seating area where I’ll be able to drink coffee and do crosswords on the weekends. 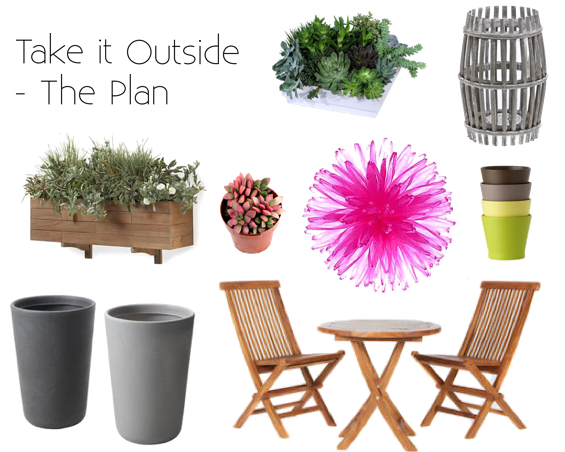 So how are your spring outdoor projects coming along? Have any advice on plants that I should use on the deck?